One must point out that the true test of the success or lack thereof of the Babangida years can be resolved if we were to subject to real test, the indexes of actual growth or decline of Nigeria in the period. Better still, it might help to do something of a peer review process - compare the Babangida era in Nigeria with say, the neighbouring government of Jerry Rawlings in Ghana. Both of them were military dictators. And here a little comparative history might suffice. The history of Nigeria and Ghana flow from the same colonial navel. Both countries came fully under British colonialism at the turn of the last century. The Gold Coast was an attractive investment at the edge of the Atlantic as was the Oil River (the Niger Delta) whose trade was quickly cornered by Taubman Goldie of the United Africa Company, the trading company chartered by her majesty's government to conduct the strategic pacification of the West African “holdings.” But to subdue West Africa, the British had to fight battles and two of the fiercest resistance wars against British rule are recorded in Nigeria and Ghana. In Ghana was the famous “Ashanti campaign” , something of the last stand by the Ashanti over the question of political and economic autonomy. In Nigeria, Lugard whom Taubman had appointed to oversee British interest had killed Atahiru, the Caliph of Sokoto and the Sokoto caliphate had collapsed, the Oyo and Benin Kingdoms had collapsed, and the powerful Ovonranwen exiled to Calabar; even the merchant princes, Jojo n'Opobo (Jaja of Opobo) and Nana of Ebrohimi, had been overwhelmed. But the British waged their longest campaign in Africa with the Igbo resistance of the hinterland. It took them thirty years from 1900-1930 and six military expeditions , the Aro, Ekumeku, Onitsha, Ahiara, Ikwo and the Ezza campaigns, to finally subdue the Igbo who adopted guerilla tactics ( Ndi Oluo-Ogbalaga) until Eze Nri Obalike was forcibly brought to the Awka courts in 1930. Nigeria and Ghana thus came under the same suzerain, and were for a while administered from Accra under a common services up till sometime in the 1930s when we shared the same Bank of British West Africa, the same West African Supreme Court, the same West African Legislative Assembly, and the same West African administration. We know the story of how an American-educated educationist and preacher, Dr, Aggrey stimulated the imagination of a young Nnamdi Azikiwe who thereafter, in imitation of Aggrey sailed, not to England, but to America in pursuit of “a liberating education” and we also know that Azikiwe returned, not to Lagos or Onitsha, but to Accra, where he had edited the African Morning Post in the course of which he met and influenced Francis Kwame Nkruma whom he gave the letter that admitted him to Lincoln University and the circle of Pan-Africanists, and of course a course that would change the anti-colonial movement. Both men fought British colonialism, and helped enormously to secure independence for their country, but here the story diverges: for while Azikiwe was not allowed to “rule” Kwame Nkruma emerged the premier of independent Ghana and in the period, set the tone of Ghana's place in the imagination of the world. But their fate again converged in 1966, when an internal mutiny led by Emmanuel Ifeajuna in January of that year, toppled the civilian government in Nigeria. Ifeajuna's coup failed, and he fled to Ghana to Nkruma's protection at Winneba. Not long after, in February 1966, elements of the Ghanaian government with C.I.A support toppled Nkruma's government. Nigeria and Ghana thus came under the thumb of military rule. A slight divergence of history also occurred here, for while Nigeria slipped into civil war, Ghana under General Akufo tried to mediate peace at the famous Aburi conference. But from 1966 to 1979 Nigeria and Ghana were under military oligarchy. The difference was that by 1970, Nigeria was awash with new wealth from oil, while the collapse of the international commodities market had rendered Ghana's cocoa and gold incapable of supporting Ghana's economic aspirations. Ghana's economy collapsed to the point that the Cedi, the local currency could no longer be used even for domestic transaction. Ghana suffered massive brain drain, its best professionals left the country and went in search of livelihood. Many came to Nigeria as teachers, doctors, engineers, musicians etc. Nigerians must now wonder about the origins of the word “Ghana-must-Go” Here is what: in the 1980s, the Shagari government in a moment of outrage repatriated hundreds of thousands of undocumented Ghanaians who had migrated to Nigeria in search of both menial and professional work. Many of them packed their belongings into mammy-wagons with the bags that we now know as “Ghana-must-Go.” Then came Jerry Rawlings who began a systematic reconstruction of Ghana, starting with a brutal cleaning of the Augean stable in 1979. By the time he left in 2000 after overseeing a very smooth handover, Ghana had regained its confidence with the fastest per capita growth in sub-Saharan Africa. If Rawlings had $12.8 billion, there would have been no Okigbo panel report. And so contrast it with what happened to Nigeria between 1985-1993, and we see a country that had lost confidence in its self, stripped of dignity and of a dream. 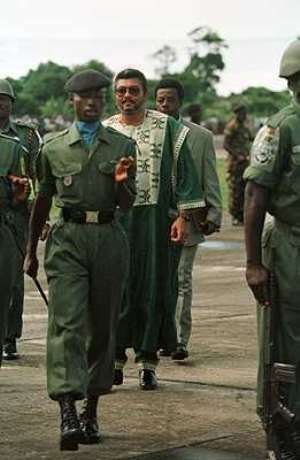 While Rawlings left Ghana a much better place than he met it, Nigeria's military oligarchs left Nigeria with massive debt, a cataleptic economy and a club of billionaire-Generals. Now, I have gone through this long history merely to refute John Shagaya's reported comments in a Nigerian newspaper about how Nigerian military officers were more equipped to conduct the business of statecraft and politics because of their military discipline, on a recent visit to Umuahia, where he had gone to further the campaign to elect Babangida in 2007. Give me a break, General! No military institution anywhere in the world has ever left a nation more ragged than the Nigerian military in the course of its career in politics. No disciplined army conducts coups against the country which it is constituted to protect, and then proceeds to strip it of its legitimacy as happened on every count when the military has intervened in Nigeria with the acme on June 12, 1993. Let me therefore put it in plainer language: the military under which John Shagaya served and rose through the ranks from depot sergeant in Zaria to General and millionaire, was not a disciplined force. Evidence: the state of the nation, even today run by the ex-Generals. Another General will of course be the final death knell.